There are nearly 100 shopping malls in Florida. The third largest mall in the United States is Aventura Mall in Miami-Dade County. The Mall in Aventura is an important part of an area that includes the Turnberry Isle championship golf course and resort, Gulfstream Park Casino and thoroughbred horse track, and the upscale Golden Beach/Sunny Isles residential area. It is located at 19501 Biscayne Boulevard in northeast Miami-Dade County. It has estimated foot traffic in excess of 28 million visitors per year and is the second most visited mall in the United States. 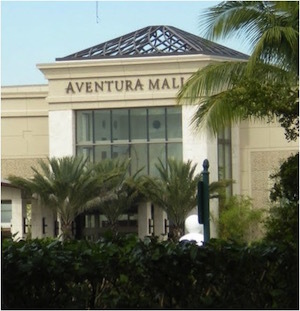 Aventura Mall is a favored and desired destination for many international travelers from Argentina, Brazil, Colombia, Venezuela, Spain, England, Germany, Russia, Japan and China as well as many other international locations. Unfortunately, those visitors, customers and shoppers get hurt through no fault of their own. That is where our Aventura Mall Personal Injury Attorneys of Miami at the Wolfson Law Firm can help you, your family and your loved ones. Just call us at (305) 285-1115 right now. Parking lot collisions happen frequently and are a common cause of shopper’s injuries. Pedestrian accidents can occur when there is poor lighting. The failure to maintain the parking lots can cause many car accidents. If the arrows and stop signs posted and painted on the ground are not properly maintained, car crashes will happen. Some drivers are careless and occasionally rude. Our Aventura Car Accident Attorneys can help you identify potential defendants and aggressively serve your best interests. Drunk Drivers. Since Aventura Mall has restaurants that serve alcohol, the possibility of drunk driving accidents in the parking lots is raised exponentially. Shopping carts that are poorly maintained can cause injuries. Broken edges that can lacerate shoppers' hands and fingers. Shopping cart wheels fall off. Folding parts that are broken can injure a child or the parent. Premises Liability Casesinclude merchandise falling on customers. It may include debris and garbage from shelves and products on shelves. Structural failures can also cause personal injuries including tiles in the ceiling, floor or stairs that are worn out or broken. Slip and falls and trip and falls are by far the most common type of Miami shopping mall injury including. Bathroom floors that are wet from leaks or broken plumbing or the simple failure of maintenance. Escalator and elevator injuries can also occur. Elevators can fall or fail to line up at the designated floors causing a trip and fall. Escalators with improperly aligned rails, steps that have not been properly synced, sudden stops or jerking movement, improperly maintained demarcation points at the end of the escalator and broken steps. Mob Behavior and trampling may seem to be rare but think about “Black Friday” sales. Grand openings and celebrity appearances can also cause small kids and the elderly to be trampled and knocked over. If the Aventura Mall anticipates events that will produce mobs, then it is the management’s job and duty to provide a safe environment for all of its visitors. If they don’t then they are responsible for your harms and losses. Criminal assaults, shootings and robberies happen regularly in shopping mall bathrooms and parking lots. Criminals stalk shoppers by following them to their cars and robbing them. Aventura Mall has a duty to provide adequate security in the form of guards, patrols and monitored surveillance cameras. These measures act as a deterrence to the criminal element. The mall and local police keep accurate statistics of criminal acts. If there is an increase in muggings and robberies, then it is up to the Aventura Mall management to increase the security. If they don’t then our Aventura Mall Serious Injury Lawyers in Miami will seek to hold the management accountable. It should be clear by now that more than one person or company may be responsible for your injuries and damages. Our Aventura Mall Slip and Fall Attorneys can investigate the facts of your injury. We can consult with the necessary experts to pinpoint the exact cause or causes of your injuries. It is a complicated task but it one that our Aventura Mall Personal Injury Lawyers undertake on a regular basis. We can help you too. All you need to do is call us today at (305)285-1115 for your free consultation. If you were injured in a trip and fall, slip and fall or car accident at the Aventura Mall, then give us a call right away. If you are not sure if you have a case, you should call us at (305) 285-1115 for your free consultation and get answers you deserve from our Aventura Mall Slip and Fall Attorneys in Miami. The Wolfson Law Firm in Miami has served victims of personal injury and the loved ones of wrongful death victims for over 60 years. Our Spanish speaking clients appreciate the ability to speak directly with Jonah Wolfson who is a bilingual personal injury attorney in Miami. He is available to speak to you now. Our personal injury lawyers in Miami have helped injured people from Miami, Broward, Palm Beach as well as Asia, South America and Europe. The Wolfson Law Firm also represents slip and fall injury victims in North Miami Beach, Miami, Miami International Airport (MIA), Sunny Isles, Miami Beach, Flagami, Fontainebleau, Allapattah, Hallandale Beach, The Roads, Wynwood, FIU, Midtown, Westchester, Ives Dairy Estates, Little Havana, Miami Gardens, Golden Beach, Hollywood and other cities throughout South Florida.